12:15 ET (Thursday): Tornadoes left destruction in Illinois late Wednesday night, reportedly damaging homes and a gas station in the central part of the state. The outbreak of severe thunderstorms pummeling parts of the Midwest is expected to continue into Thursday morning. The weather service received numerous reports of tornadoes near Chicago, though the exact number was not immediately clear. 10:45 ET A tornado watch has been issued for parts of Indiana, Ohio and Kentucky, including Indianapolis, Columbus, Dayton and Cincinnati through 5 a.m. Thursday. Storms have passed the Chicago are, which prompted a Copa America soccer game to be halted. So far, 10 tornadoes have been reported, according to the Storm Prediction Center. A tornado warning remains in effect for Pontiac, Illinois. 10:05 ET Storms are entering Northwest Indiana after storms blasted parts of the Chicago area. So far, there have been eight reports of tornadoes in Northern Illinois. The Storm Prediction Center is also working to extend tornado watches into Indiana and Ohio this evening. 9:15 ET Soldier Field is being evacuated during a soccer match in Chicago. A storm with 65 MPH winds is headed directly for downtown Chicago. More than 50,000 fans were on hand for the semifinal soccer match of Copa America. 8:40 ET The National Weather Service has confirmed a tornado is on the ground west of Chicago. A line of storms have developed in Northern Illinois. Thunderstorms are producing winds of 70 MPH. 8:18 ET The first tornado warning was issued for Amboy, Illinois as radar indicated a strong storm with the possibility of dropping a tornado was ripping through the Northern Illinois town. This tornado below dropped down Wednesday evening east of Amboy. 7:15 ET Tornado watches were issues for parts of Iowa, Illinois and Indiana minutes ago as storms have developed around the Iowa/Illinois border. The storms are expected to swiftly move east into Illinois and Indiana. The watch is in effect until 1 a.m. CT. The Storm Prediction Center says winds of 80 miles per hour is possible with Wednesday's storms. 5:35 ET The Storm Prediction Center said it will likely issues a tornado watch for parts of Wisconsin, Illinois and Indiana in the coming hour. Storms have yet to fire in the area, but some sunshine has caused the atmosphere to destabilize, likely resulting in storms firing shortly. Read below for the setup from meteorologist Jason Meyers. Midwestern states from Iowa and Minnesota to Ohio and West Virginia are on pins and needles for the strong winds, large hail and possible tornadoes set to move through this afternoon and evening. The bullseye for the severe storms encompasses cities like Chicago, Indianapolis and Columbus, Ohio. 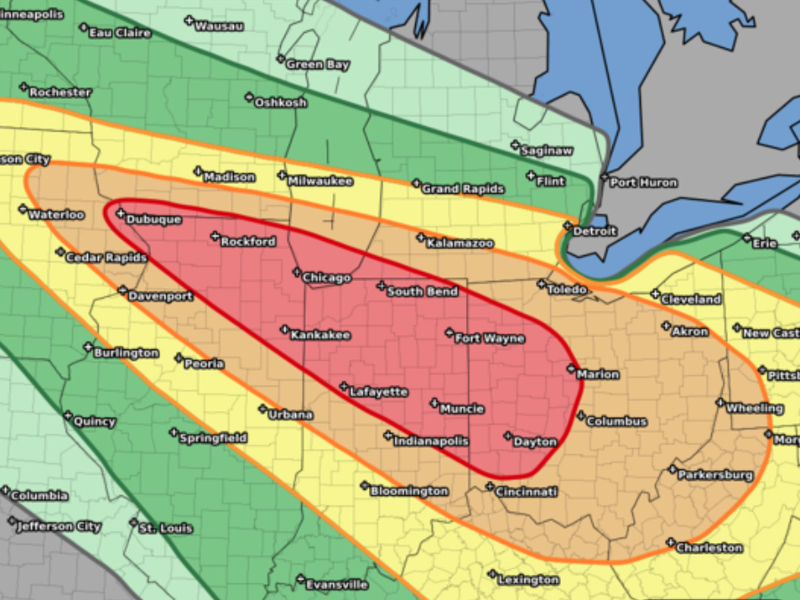 The rest of Ohio, Indiana, Illinois, and neighboring states are also in the bulls-eye for severe storms, including places like Cincinnati, Ohio; Cleveland, Ohio; and Detroit, Michigan. The weather setup across the Great Lakes is most likely for a line or multiple lines of strong to severe thunderstorms moving from northern Illinois, across Indiana and into Ohio, possibly resembling a derecho. When lines of thunderstorms develop like this, the major threat is strong, damaging winds capable of knocking down trees and power lines. Some forecast models are even hinting at hurricane force winds. Large hail is also a possibility, and while a tornado or two could develop, the best chance for any tornado activity is going to be in northern Illinois west of Chicago. Chances are good the National Weather Service will be issuing watches and warnings, and it's important to know the difference and what to do when one is issued. Watch the video at the top of the story to find out more.